Pencil drawing by Frederick Charles Maisey of a carved slab with nagas, serpent deities, from Ranod in Madhya Pradesh. Inscribed: 'Ng Deo at Ranod on the bank of the Airwati about 100 yards SE of river near the Kirki leading to the Ghari', with notes. On reverse: 'Moti - Regt. Camp Follower. (Pariah Dog!) Sketched at Lahore Augt. 1847'. 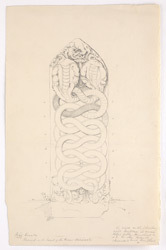 This drawing depicts a carved slab with two intertwined serpents or nagas. The nagas, from the Sanskrit word 'nag' meaning serpent, are mythical semi-divine beings that live in the region of the underworld (Patala) called Nagaloka. They appear as snakes but can take human forms and the females often take the shape of beautiful women and marry humans. In ancient Indian mythology and religion the snake (cobra) is one of the most recurrent symbols. Snakes are associated with water, the underground, and fertility. In Hinduism they were adopted as emblems of Shiva and Vishnu, in his role as creator, rests on the cosmic serpent Shesha. In Buddhism and Jaininsm they are the protectors of Buddha and Parshvanath respectively.